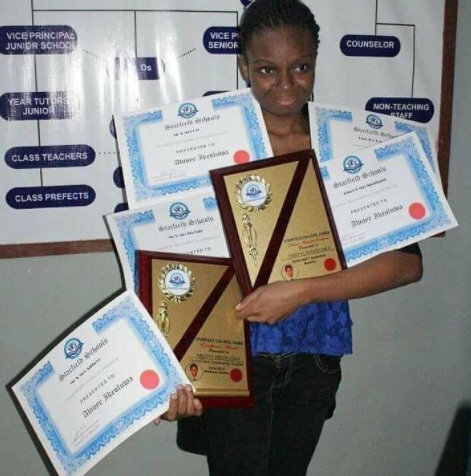 Just 2 days after I published this post, celebrating exceptionally intelligent Edo Ladies here and after this young lady from Enugu State, Cynthia Chineche, was also celebrated just last month here for clearing her WAEC results, another lady, Ikeoluwa Abioye has made history by scoring all As...A1s to be precise in all 9 subjects she sat for in the 2017 May/June West African Senior School Certificate Examination (WASSCE).The subjects are, Maths, English, Further Maths, Chemistry, Physics, Civic, Catering, Biology and ICT. She also scored 305 in her JAMB. Unlike Cynthia who opted to get her first degree in Nigeria, 15 year old Ikeoluwa, who is an indigene of Irepodun Local Council of Osun State revealed she would love to study in either Massachusetts Institute of Technology (MIT) or Harvard University for a degree in Computer Engineering.